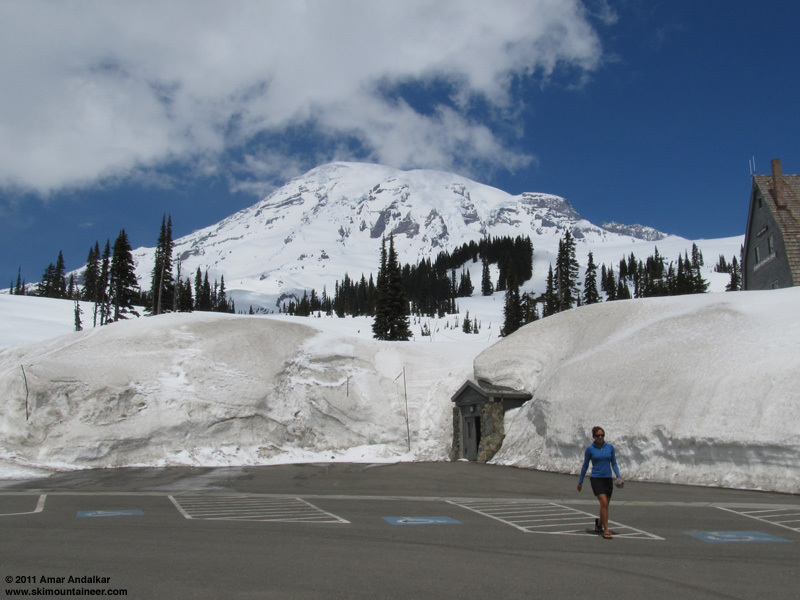 Summary: Enjoyed three days of glorious sunshine and near-calm winds on the Mountain, with two nights spent at the Camp Muir public shelter. 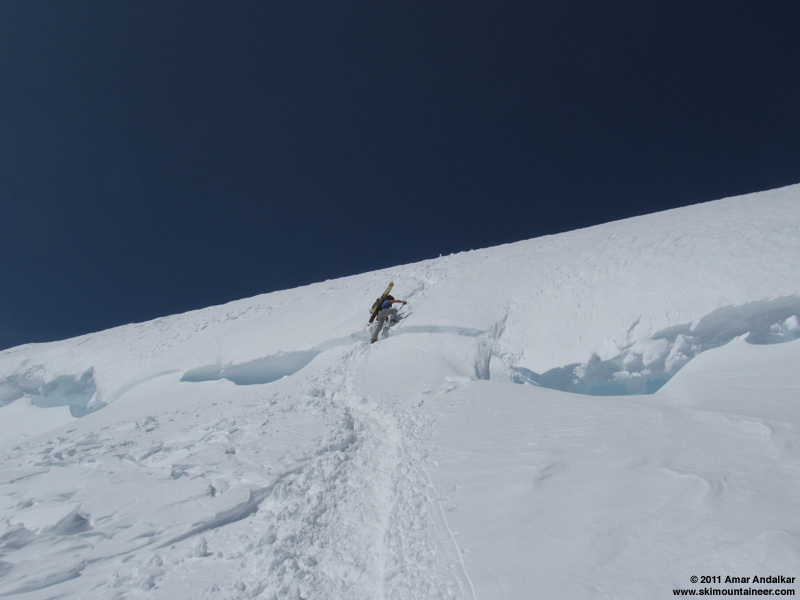 Skinned up to Muir on the afternoon of May 18. 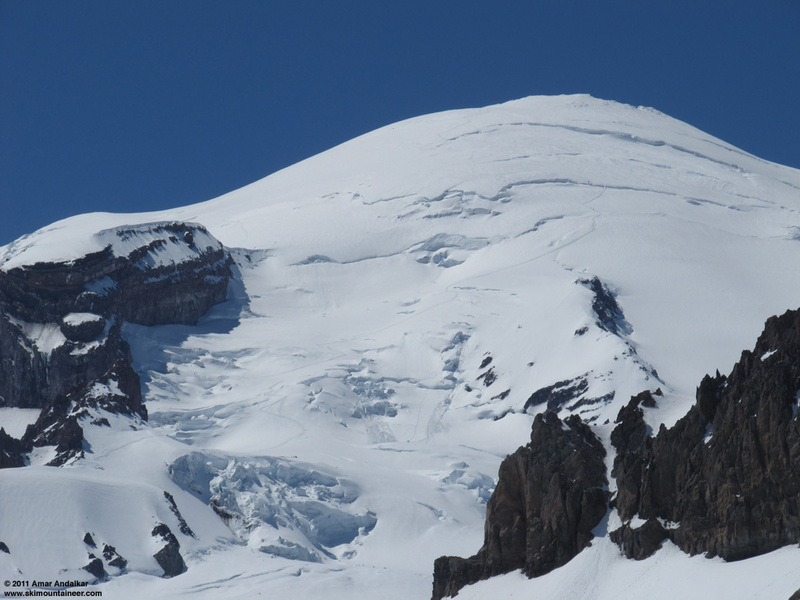 Climbed via Ingraham Direct on May 19, the route is in good shape (for now), with only a couple of sketchy crevasse crossings, near 11800 ft in the icefall and near 13100 ft at the bergschrund. 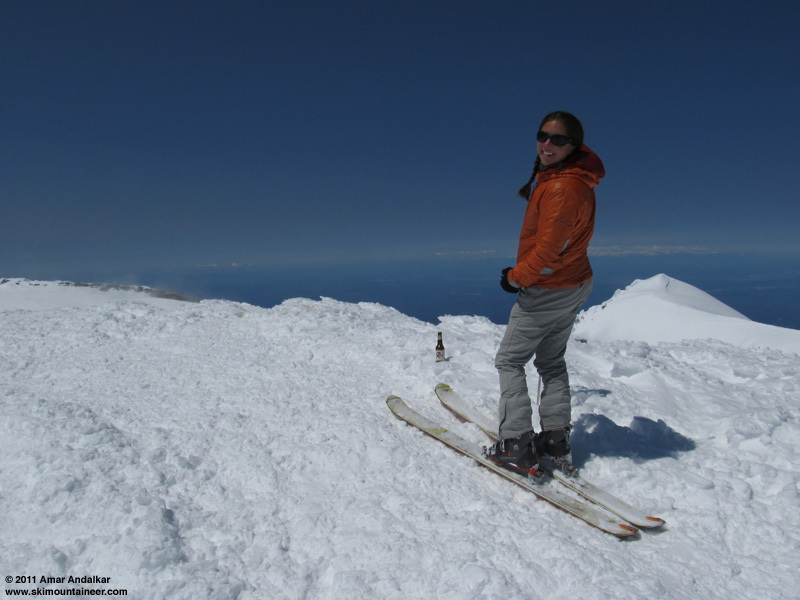 Found a chilled bottle of Rainier beer waiting for us atop Columbia Crest, and then skied from the summit back down to Muir on nicely softened snow, with no ice or sastrugi at all. Rare to find it that nice above 13000 ft. 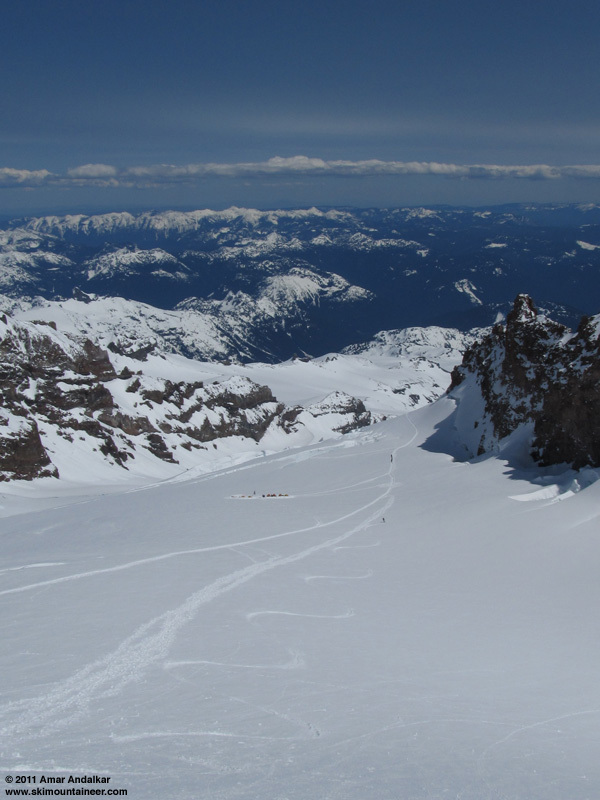 The next morning, we got served breakfast in bed at the Muir hut courtesy of IMG, then skied sweet corn down the Snowfield a few hours later and out to Nisqually Bridge via the Chute. About 9100 ft of ascent for 10560 ft of total ski descent. Awesome! Details: Hannah had returned to Washington in early May after spending the last six months in Colorado, and she was eager to head back up to the summit of her favorite Mountain. With a forecast for three days of sunshine and light winds from Wednesday to Friday, it looked like an ideal weather window for a spring summit ski. We planned to climb Gibraltar Ledges and ski down via Gibraltar Chute if snow conditions looked good as we passed its entrance during the ascent. 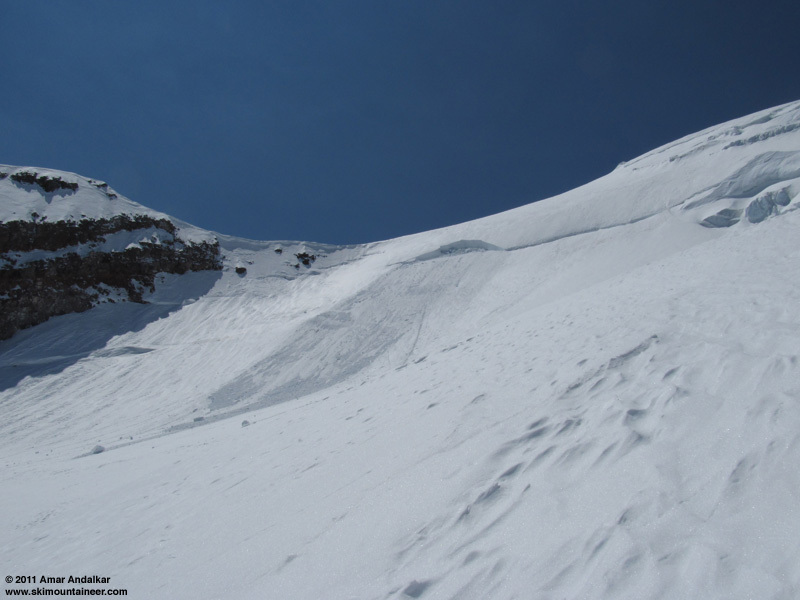 The 50+ degree Gib Chute is filled in very fat this spring, as good as it ever looks, but snow conditions make all the difference between a sweet run in smooth steep corn snow, versus a nasty life-threatening epic on adverse snow. 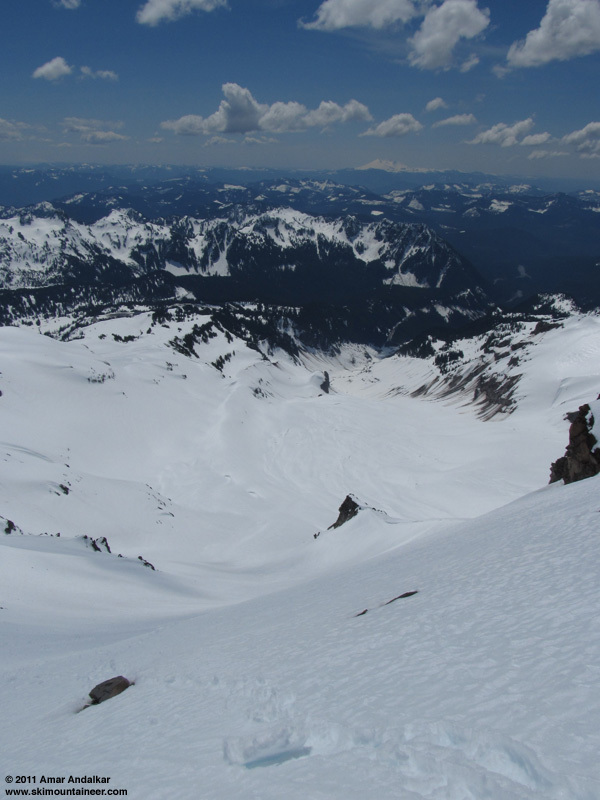 Zoomed view of Nisqually Ice Cliff and Gib Chute (right) from the Muir Snowfield. Arrived at Paradise just after noon, registered and paid our newly-increased $43 annual climbing fees, then made a calculated decision to leave the rope and glacier gear in the car -- we were comfortable with our decision, but I wouldn't recommend it for others right now on these routes. Headed up from Paradise just before 1pm, under mostly sunny skies but with a surprising light shower of graupel pellets falling from the few puffy clouds. 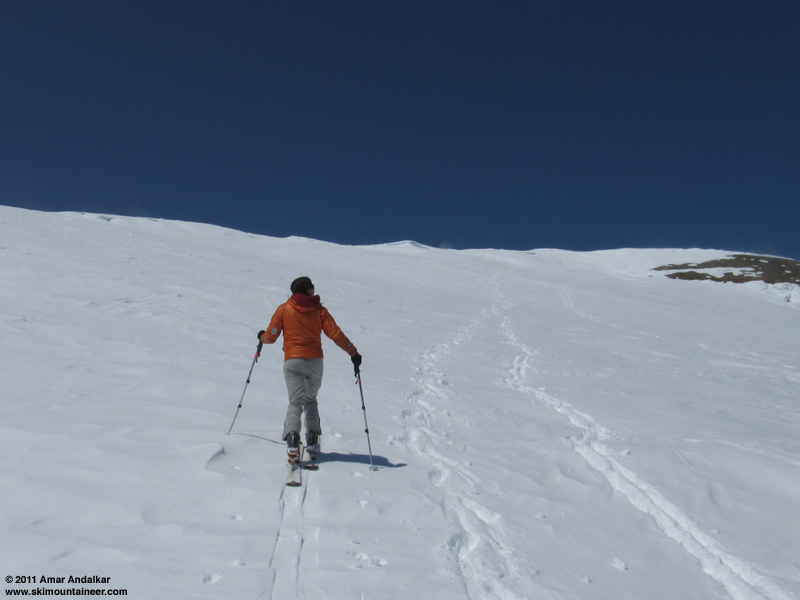 Easy skinning on well-softened snow, with a nice skin track all the way up the Muir Snowfield. Reached Camp Muir just after 5pm, and saw with disappointment that there was no bootpack heading up Cowlitz Cleaver towards Gib Ledges. Climbing that way would involve putting in the route by ourselves the next morning, breaking trail the whole way through the 1-2 ft of new snow that had fallen on Sunday, now variably consolidated to an unknown degree -- it sounded like a LOT of work. The other option was to follow the well-worn bootpack ascending the Ingraham Direct route, used by scores of guided climbers, well-marked and maintained -- a much easier path. It was an easy choice, especially considering that I still felt tired and out-of-shape as I have all of this year, still carrying 15 lbs of unwanted excess fat. Not to mention the additional tiredness due to the 4800 vert I had skied the day before, skinning up the closed Crystal ski area twice and skiing down the single lovely untracked corduroy groomer. So the Ingraham it would be. Looking up Cowlitz Cleaver toward Gibraltar Rock and the summit dome. We headed over to the rangers' hut and hung out for a while chatting with Stefan Lofgren (supervisor of climbing rangers). 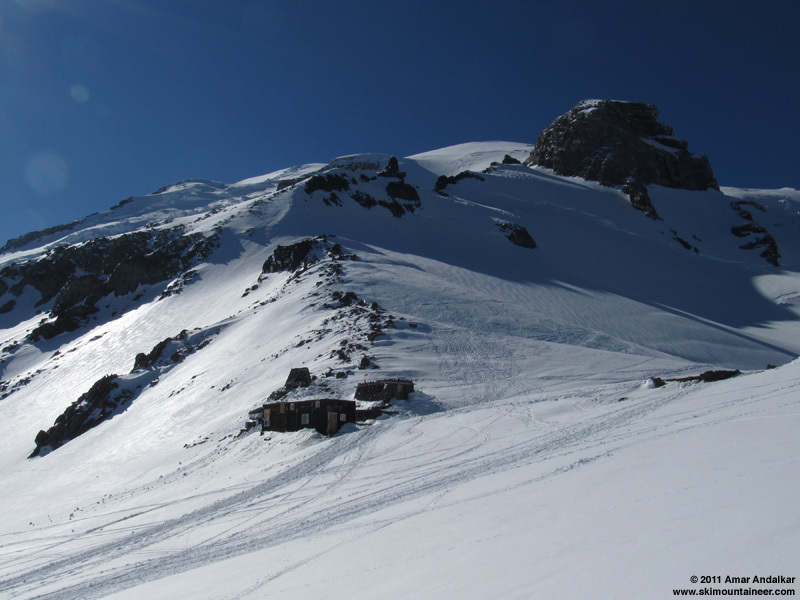 He had just finished installing the long-awaited new Camp Muir webcam and upgrading the datalogger to accommodate the additional data stream. 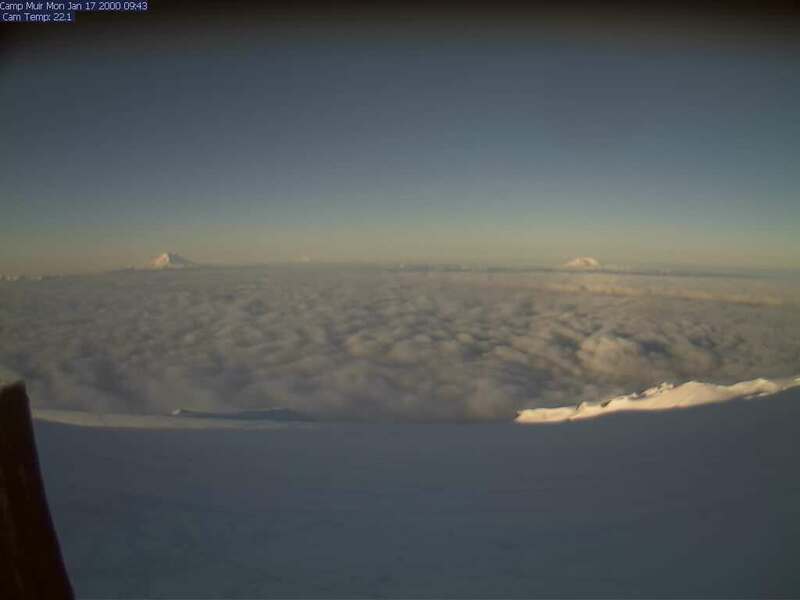 The webcam looks south towards Mount Adams, with a wide-angle view of the upper Muir Snowfield, and images should be online soon (one webcam image per hour is apparently all the current communications link can handle). 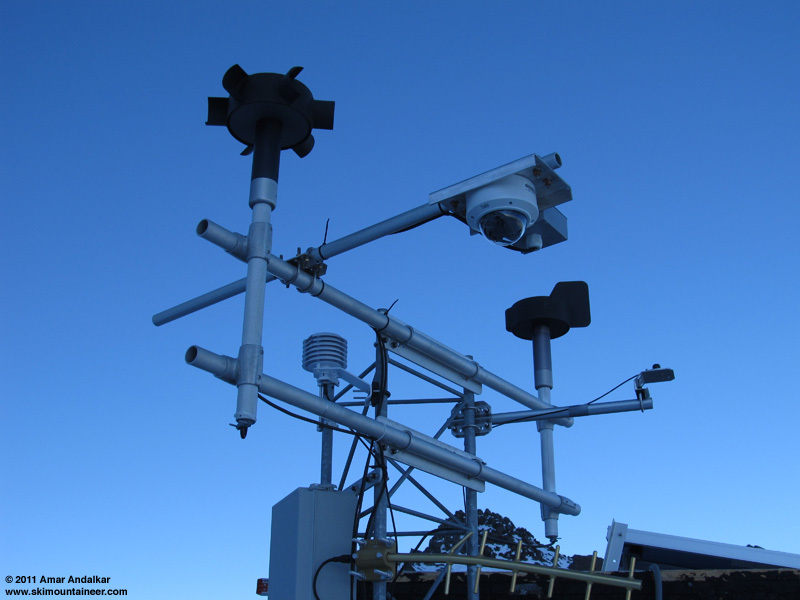 Unfortunately, the Muir NWAC telemetry data went offline temporarily too as of 1300 PST that day due to the hardware and software upgrades. The new webcam (inside the clear inverted dome) mounted on the NWAC instrument tower. Only a half-dozen other climbers in the Muir hut on this night (apparently it had been much more crowded the previous night). 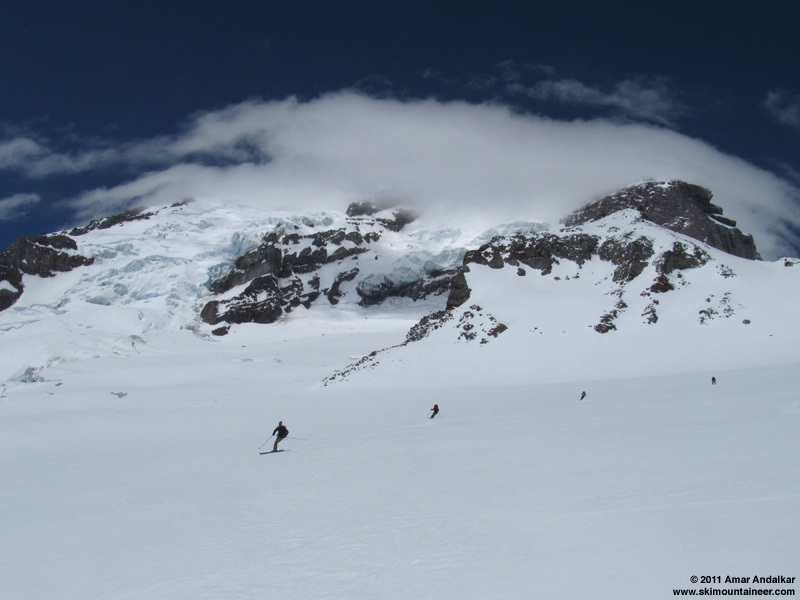 This included a team of UW glaciologists and seismologists, who were planning to install a seismic and GPS station atop Gibraltar Rock early the next morning. 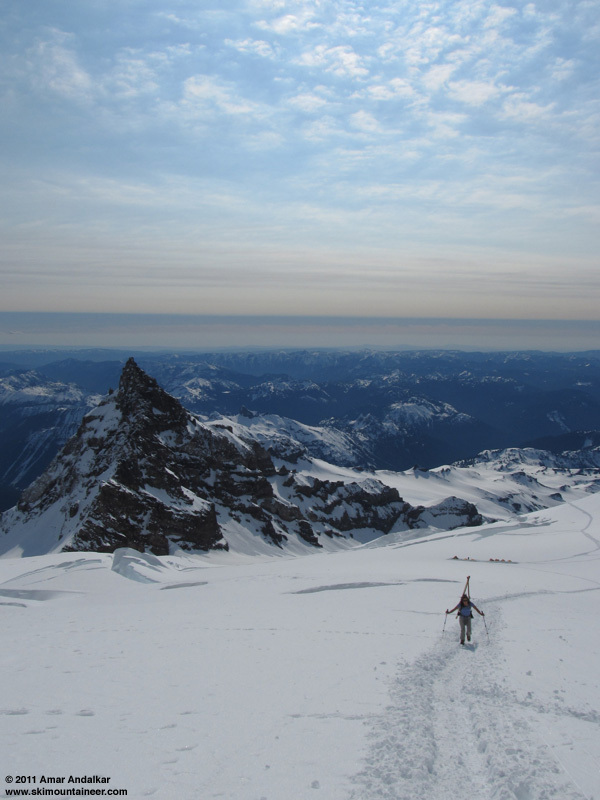 We set our alarm for 4:30am, planning to be climbing by 6am for a roughly noontime ski descent from the summit. Slept soundly through 4 alarms, then awoke with a start after 5:30am. Oh well -- finally underway at 7:30am, climbing firm frozen snow in the warm sunshine, crampons on feet and skis on packs. A few high clouds to the south, but clear skies overhead and calm winds. 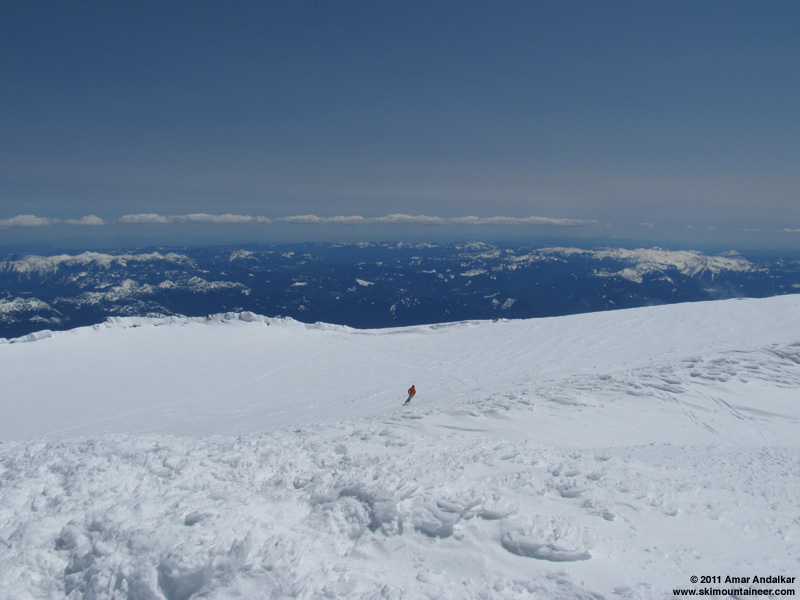 Crossing the Cowlitz Glacier, with Camp Muir and Mount Adams in the distance. Near 11000 ft came the first full view of Ingraham Flats, the Ingraham Icefall, and Disappointment Cleaver. In an instant I was unexpectedly overwhelmed with emotion, I struggled to fight back tears, but could not. Had a good cry standing there for a couple of minutes, thinking of Dave Pinegar and of Monika, close friends with whom I'd been at this very spot on trips years before, both friends now lost in tragic falls from high places earlier this year. Maybe sometimes it's best not to stifle the tears and just let them flow instead. Looking up at Ingraham Flats, the Ingraham Icefall, and Disappointment Cleaver. Took our first break at 11200 ft, just above the Ingraham Flats camp. Then uneventful climbing in the warm morning sunshine up through the Ingraham Icefall, the snow still well-frozen. The route takes several sharp switchbacks as it climbs through the Icefall, with the few snowbridge crossings well marked, and not particularly scary or thought-provoking. Pretty standard conditions for this route. Little Tahoma and lovely sky. Another rest break at 12400 ft on a large flat spot above the Icefall, then the route traverses steeply up and right as usual to avoid the massive seracs above this point, with several more steep switchbacks to 13000 ft. The last of several rope teams of descending climbers passed by us, and we'd see no one else for the next 3 hours. 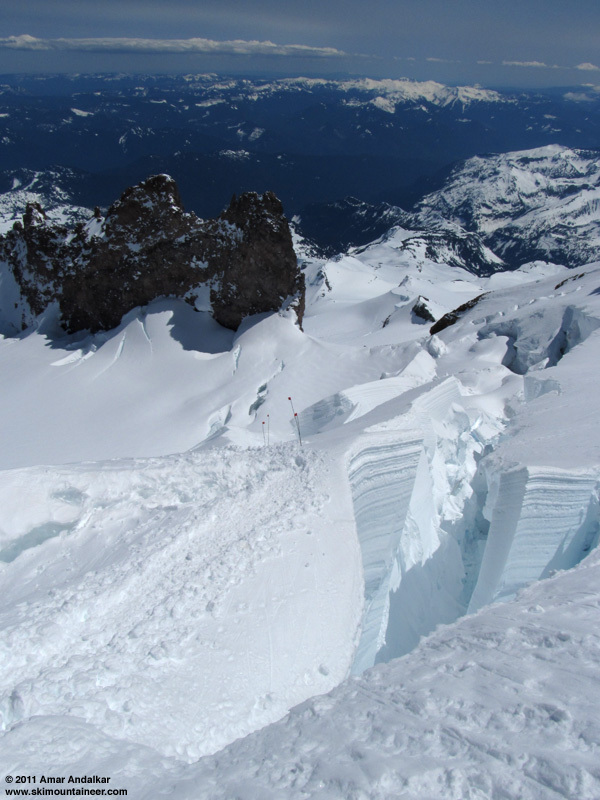 The final challenge is the bergschrund near 13100 ft, with a short steep slope and an 18-inch gap opening in the snowbridge, requiring a large step to cross. Climbing over the bergschrund near 13100 ft.
Another incipient crack that was easily crossed on the flatter terrain shortly above, then a cruise up gentler switchbacks to the low point of the crater rim at 14180 ft. A bit windy here at the rim with a cold northeast breeze, and we ditched our packs and crampons in a sheltered spot just below, opting to skin the final stretch through the crater to the summit. Arrived on top at 12:45pm. Pleasantly surprised to find very light winds (5-10 mph) and tolerable temperatures (above 10 �F) atop Columbia Crest, with large steam clouds rising from several fumaroles in both summit craters. Pleasantly shocked to see a single unopened bottle of Rainier beer, standing proud in the summit snow. I suggested leaving it for the next summiteers to find, but Hannah alertly noticed that ice was already forming within the bottle. So clearly, it was imperative that we consume it ourselves as quickly as possible, before it froze solid. 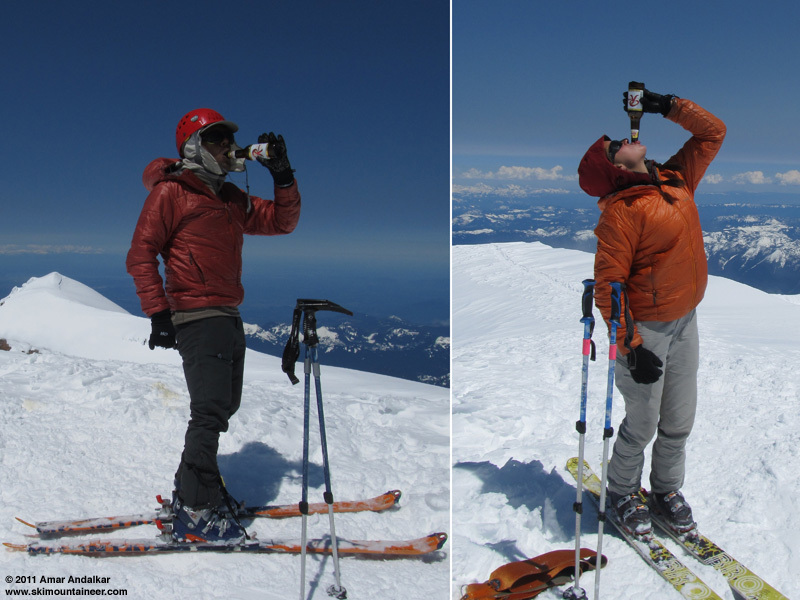 Rainier never tasted so sweet. Many thanks to the unknown bringer of beer. We hung out for a while, sharing the beer and the views and the magnificence of a near-perfect day together atop the Mountain. Hannah skied down just after 1pm, arcing sweet turns in the nice windpacked powder of the crater. I enjoyed a brief minute of total silence and solitude, watching her ski and then looking up in awe at the broad blue hemisphere surrounding me, then cruised down after her. Carving turns in the summit crater. 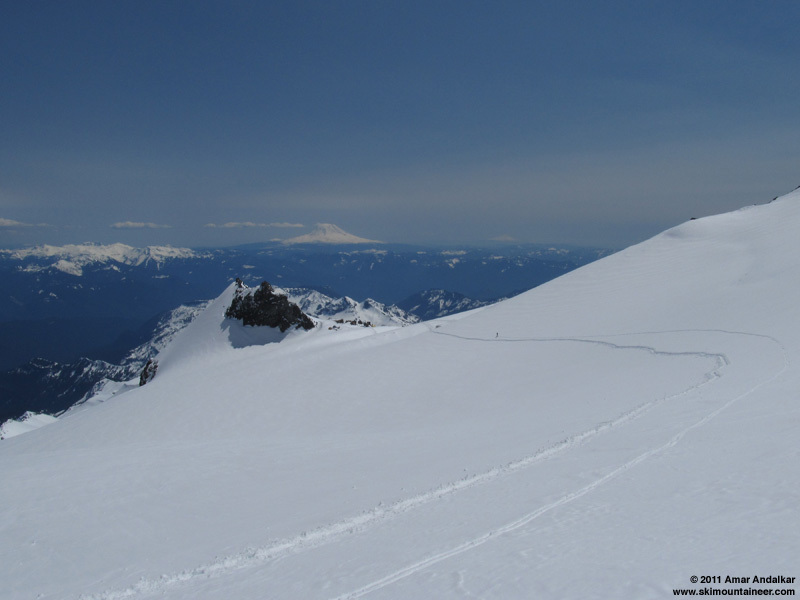 Decent snow conditions below the rim too, windpack softened in the intense sun on the southeast-facing slopes of the upper Nisqually and Ingraham Glaciers. A few areas of more breakable and unpredictable snow below 13500 ft, but nothing too bad, and mostly quite good compared to what can often be found up here. No ice or sastrugi at all. Nice turns near 13500 ft. Heavier and gloppier snow below 12500 ft, the surface oversoftened a bit through the Icefall. 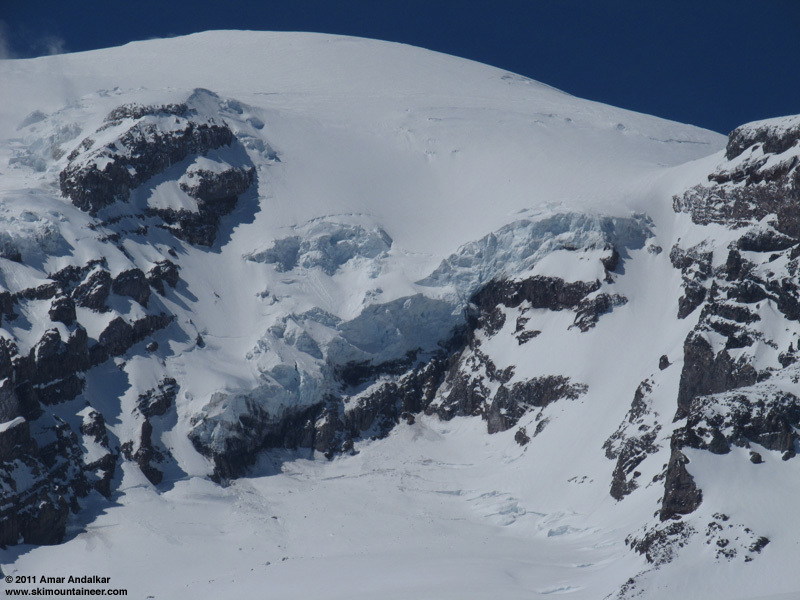 A large snow-and-ice avalanche had occurred during the day at a bergschrund near 12500 ft on the part of Ingraham Glacier just below the Gibraltar Rock saddle, with a large bite of the upper lip breaking off and littering the glacier below with car- and truck-sized blocks. Luckily it was well southwest of the current climbing route. Estimated width of the crown is about 500 ft, maximum height is perhaps 40-50 ft (!). 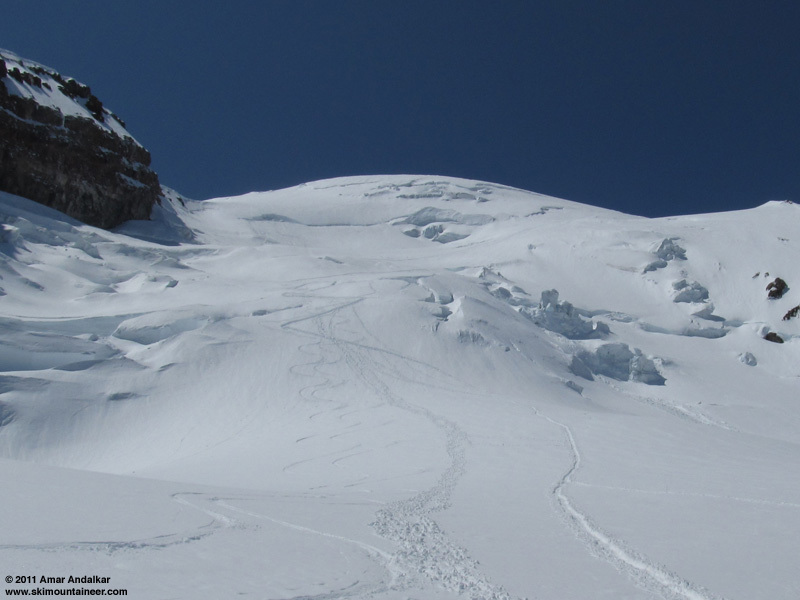 Snow-and-ice avalanche at a bergschrund near 12500 ft on the Ingraham Glacier just below the Gibraltar Rock saddle. One sketchy snowbridge crossing near 11800 ft (approximately), a long S-shaped bridge with a sheer drop of perhaps 100 ft into the crevasse on the right side. It hadn't seemed bad at all on the way up, but now it looked difficult and dangerous to ski down directly given the consequences of a fall -- so we sidestepped gingerly across on skis. Looking down the sketchy S-shaped snowbridge. 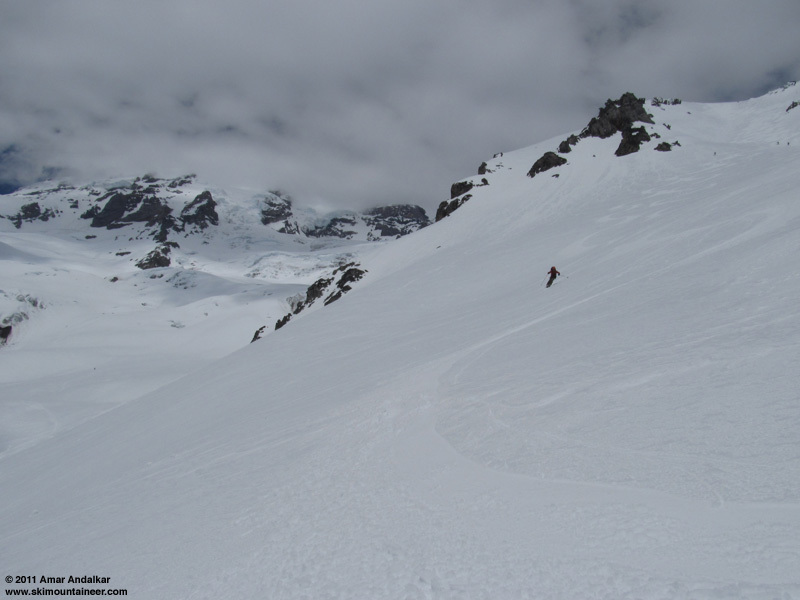 Then quickly zigzagging past the last crevasses, and finally a cruise down an open slope of nice soft corn to the Flats, arcing huge turns in relief and freedom. 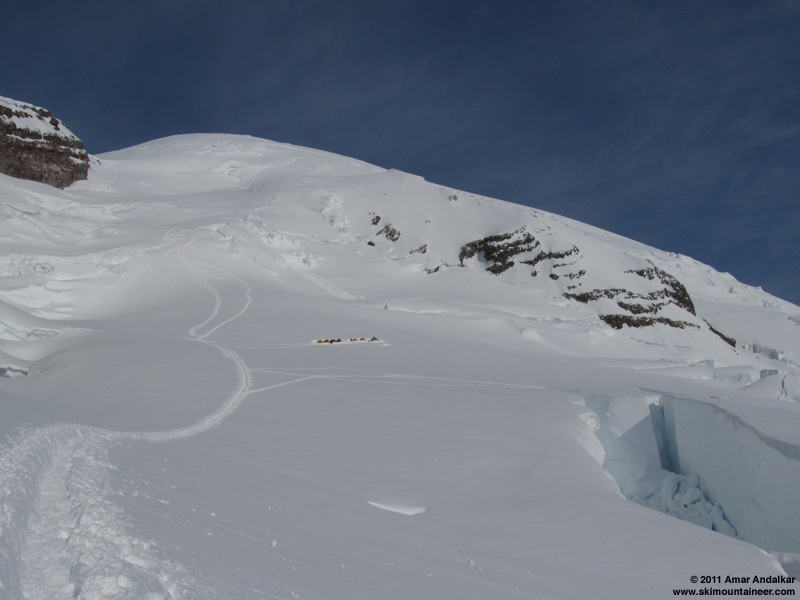 Looking back up at our ski tracks in the soft corn below Ingraham Icefall. 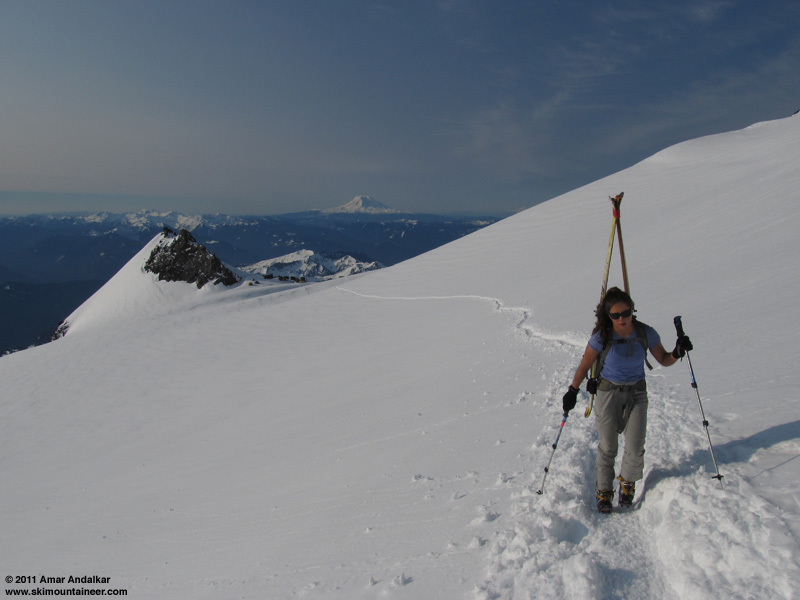 More soft and skiable snow below Cathedral Gap and across the Cowlitz Glacier, surprising to see that ours were the first and only ski tracks on the entire slope, the only marks other than the single bootpack. 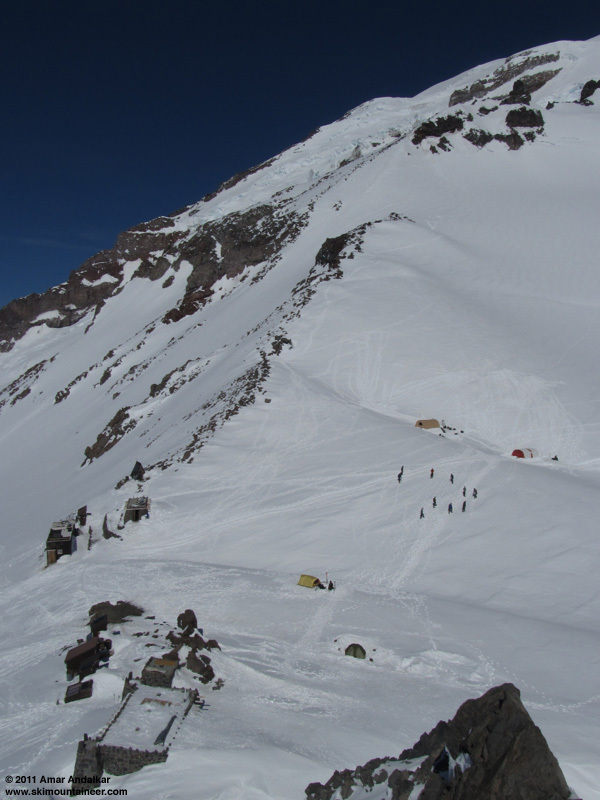 Back to Camp Muir by 2:20pm, then enjoyed a long afternoon basking in the sunshine on the roof of the storage shed, eating dinner and chatting with several other skiers, including a newly-arrived solo skier. We were mulling a possible ski of Little Tahoma the next morning, but decided it would be too difficult to hit good snow conditions on several parts of the route (from Muir, the route to Little Tahoma involves skiing down the Cowlitz Glacier to 8400 ft, then crossing a cleaver onto the Ingraham, traversing that, and climbing over another cleaver onto the Whitman Glacier -- a total roundtrip gain of over 4500 ft despite the net gain of only 1100 ft to its 11138 ft summit). Turned in to the hut by 7pm to try to sleep, only the two of us plus the solo skier. But our peace and tranquility was shattered minutes later when a team of three skiers/boarders from Salt Lake arrived, their XGK stove soon filling the hut with a jet-engine-like roar. Such are the realities of life at the Muir hut. I awoke the next morning at 5am with the Utah group, happy to get outside and photograph a fine dawn and sunrise, the bright gibbous moon hovering to the south above Mount Saint Helens, plus the notched triangular shadow of the Mountain. Sunrise on the Tatoosh Range, with Mounts Adams and Saint Helens in the distance, and the distinctly notched shadow of Big Tahoma and Little Tahoma at right. Then back to bed for several more hours, until we awoke just after 9am. We were still in our sleeping bags minutes later, when the door reopened and in walked an IMG guide, offering us their group's leftover bacon and pancakes, still warm (and with a bottle of syrup) -- breakfast in bed at Camp Muir! Delicious, thanks Dustin! Spent a lazy morning in the sunshine, waiting for the snow to soften enough on the Muir Snowfield. We originally thought 11am might be good, but clearly it was going to take a lot more time after we saw the previous day's couple (now both on skis) break camp and ski down around 10:15am, obviously on icy crust. I climbed up Muir Rock and found that I could get some data service on my Verizon iPhone (no 3G though), enough to check weather forecasts and NWAC telemetry online. Looking down at Camp Muir from Muir Rock (point 10188). 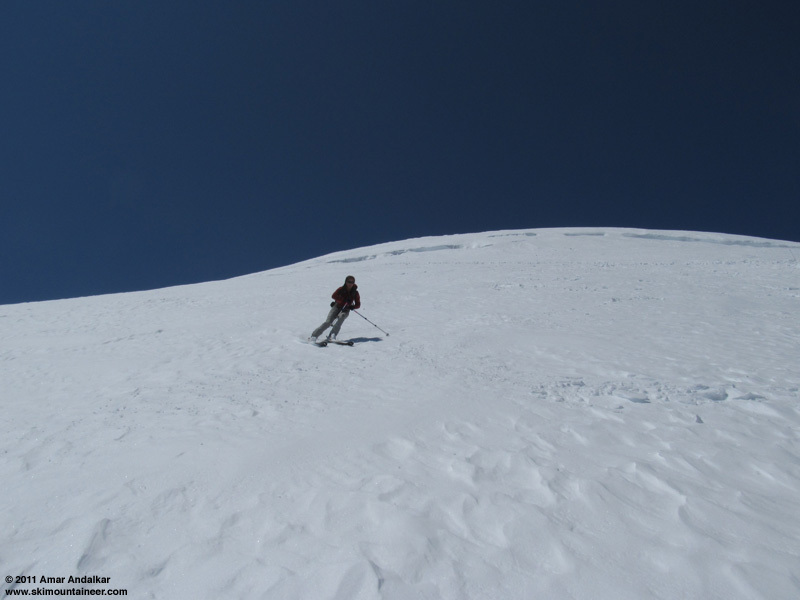 By noon the solo skier had returned from a successful summit and ski descent, and a group of three skiers including my friend Paresh had also arrived on skins up the Snowfield. 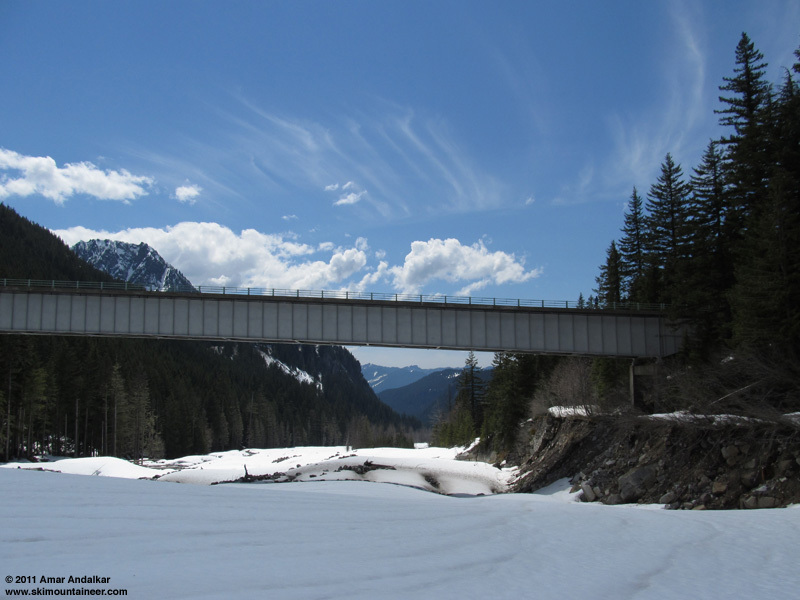 They wanted to ski down to the Nisqually Bridge, and I felt like joining them, as did the solo skier, while Hannah preferred not to, given the weight of the overnight pack and the expected sticky slushy snow on the lower Nisqually. So we came up with a good plan: Hannah would ski back to Paradise, get my car, and drive down to meet the five of us at the bridge. We followed a bit later, skiing down just before 1pm. The upper snowfield had softened into pretty nice corn, while an ominous ragged lenticular cloud had formed just minutes before and enshrouded the upper Mountain above 12000 ft. Carving the corn on the Snowfield, with the incipient lenticular far above. Nisqually Chute looked to be in good condition, with a few previous tracks from the day before, and no signs of instability. We dropped in one at a time, finding 4-6" deep oversoftened corn atop a firmer base, with excellent stability and no sluffs or rollers at all. Fun skiing, but hard work too. Looking down Nisqually Chute from 8400 ft towards the lower Nisqually Glacier and the bridge. Creamed corn in Nisqually Chute. 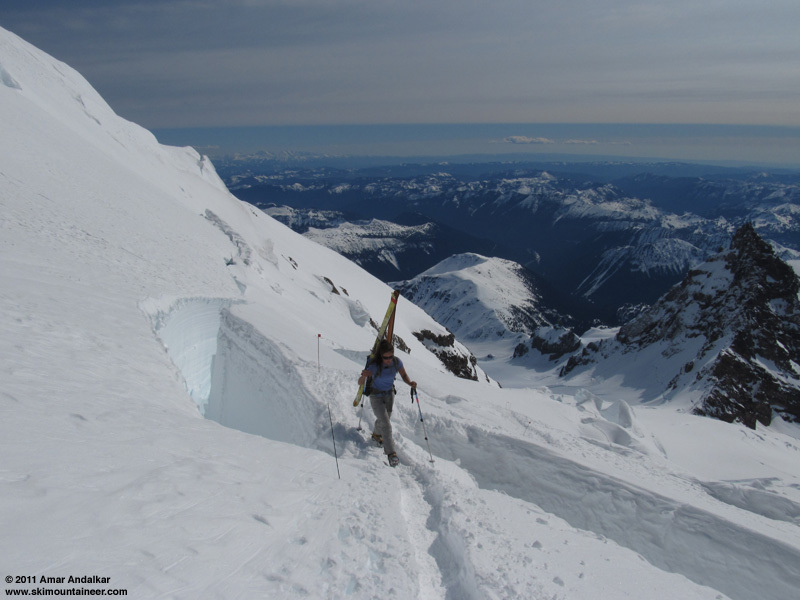 As expected, very soft and sticky snow on the Nisqually Glacier below 6000 ft, a slow ride down the gentle flats, then carving deep trenches in the mush on the steeper slopes of the now-stagnant glacial terminus. 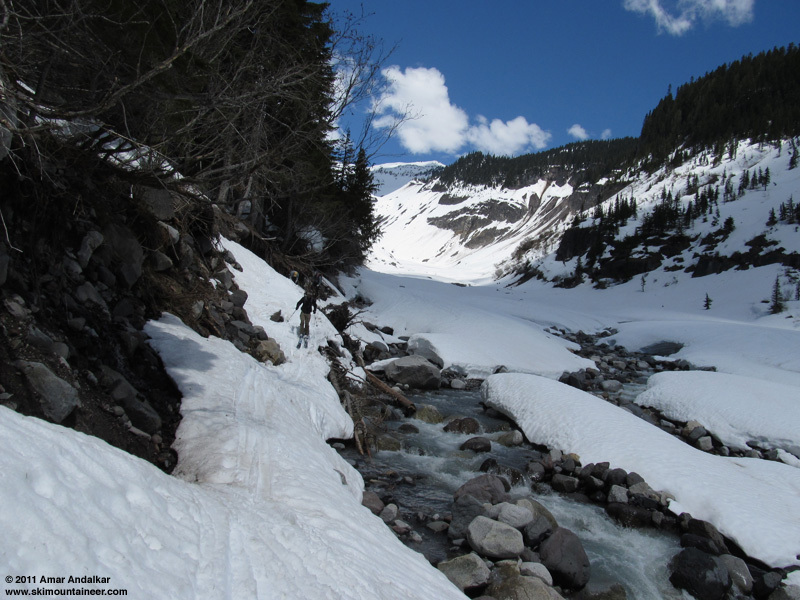 A slow-motion glide along the right bank of the river, luckily with only a few sudden lurches on extra-grabby snow, brought us to the previous ski track exiting up and right into the woods. The route along the right bank is barely passable to this point on snow, it will soon melt out in spots and the left bank will be preferable. Barely connecting on snow along the right bank of the Nisqually River channel. This ascending traverse through the woods had connected nicely to the lower end of the bridge in late April, but was now partially bare in the forest. We dropped down on snow instead towards the bridge, getting an extra 100 ft of descent down to about 3850 ft directly beneath Nisqually Bridge. Hannah was already waiting for us on the bridge, and waving down to us. A brief climb up the steep wet slope under the bridge brought us out to the parking lot just after 2pm. More nice sun and warmth in the parking lot, so the rest of the group waited while I shuttled Paresh back up to Paradise to get their vehicle. We capped off the day with beer and burgers at Whittaker's BaseCamp Grill in Ashford, lounging outside on their picnic tables, soaking in the maximum possible sunshine before the forecast clouds and rain moved in for the weekend. Another memorable trip on the Mountain, so sweet to enjoy a full dose of skiing and sunshine in an otherwise historically cold and wet Northwest spring. SYNOPSIS...TEMPERATURES WILL GRADUALLY WARM THIS WEEK AS WEAK HIGH PRESSURE BUILDS OVER THE AREA. AN UPPER LEVEL TROUGH WILL RETURN THIS WEEKEND...BRINGING SHOWERS AND COOLER TEMPERATURES. WEDNESDAY...PARTLY SUNNY. A CHANCE OF SHOWERS IN THE AFTERNOON. SNOW LEVEL 6000 FEET. WEDNESDAY NIGHT...PARTLY CLOUDY. A CHANCE OF SHOWERS IN THE EVENING. SNOW LEVEL 6000 FEET. THURSDAY...SUNNY. FREEZING LEVEL 7500 FEET. THURSDAY NIGHT...MOSTLY CLEAR. FREEZING LEVEL 8500 FEET. FRIDAY...SUNNY. FREEZING LEVEL 8000 FEET. FRIDAY NIGHT...PARTLY CLOUDY IN THE EVENING THEN BECOMING MOSTLY CLOUDY. A CHANCE OF SHOWERS. SNOW LEVEL 8000 FEET. SATURDAY...SHOWERS LIKELY. SNOW LEVEL 7500 FEET. SATURDAY NIGHT...CLOUDY WITH A CHANCE OF SHOWERS. SNOW LEVEL 7000 FEET. SUNDAY THROUGH MONDAY NIGHT...MOSTLY CLOUDY WITH A CHANCE OF SHOWERS. SNOW LEVEL 6500 FEET. TUESDAY...PARTLY SUNNY WITH A CHANCE OF SHOWERS. SNOW LEVEL 7500 FEET. Nice Amar. Sorry about your friends. A great day on the mountain has a way of healing ill feelings. There are few things that beat a sunny day on the raindawg. Nice work Amar and Hannah. Smooth conditions from the top must have been a real treat. Wow! thanks for sharing so many great pics. Looks like a couple of perfect days. That is an awesome TR! Thanks for sharing and all the photos and details - I am stoked!! Nice work Amar and Hannah! Life is good when you can ski at the drop of a hat and enjoy the sun that has been lingering behind clouds for so long. The gray and rain can get the best of us, I think Hannah has the right idea, live in Co. while the gray lingers and come to Wa. when the sun manifests. It's interesting that you posted this TR before your tours in Ca. Must have been motivated by a ski partner joining you rather than your solo trips of late. I look forward to seeing what you skied in Ca. and NEW peaks.�Although, thanks for sharing this one. I am glad you guys had a safe trip! Not sure I would have made the same call and left the rope behind, I would hate to need it and not have it, but a call each party makes and I have done the same but do not condone it. Congrats on your trip and welcome home Hannah. Thanks for sharing your adventures Amar! Great TR and photos. Nice write up and phtography, Amar. On Friday, I was looking at the very same lenticular skinning to Muir and I'm bummed I missed you guys by about an hour, as I did not reach Camp Muir until 2pm. My friend and I hit the chutes around 3pm, and it sounds like 2 hours earlier they were even more enjoyable. How can you see the image from that new camera at Muir? Is it a park camera or a NWAC camera? 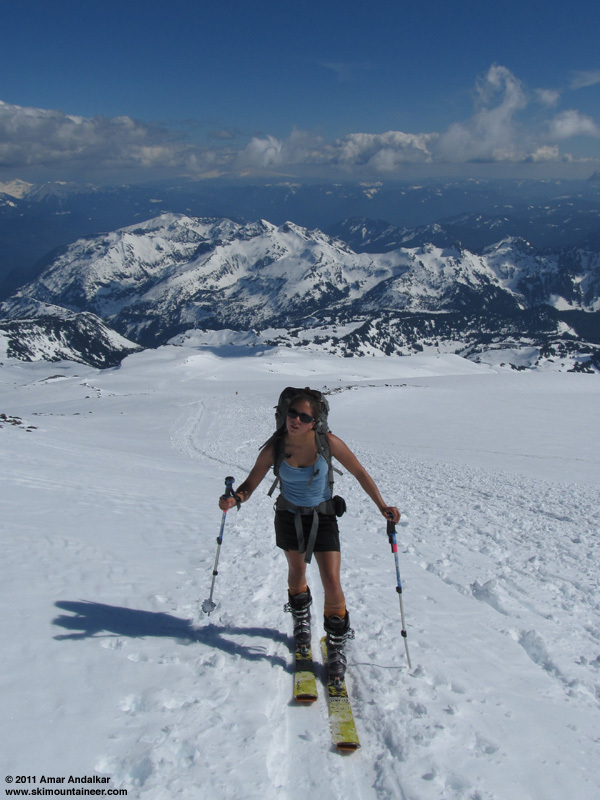 Great photos and TR Amar - Good work to you an Hanna on another beautiful ski descent! I've run into the beer fairy at Muir a few times - but never on the summit!! A good omen indeed. It was fun skiing to the bridge with you - Thanks again for the car shuttle! 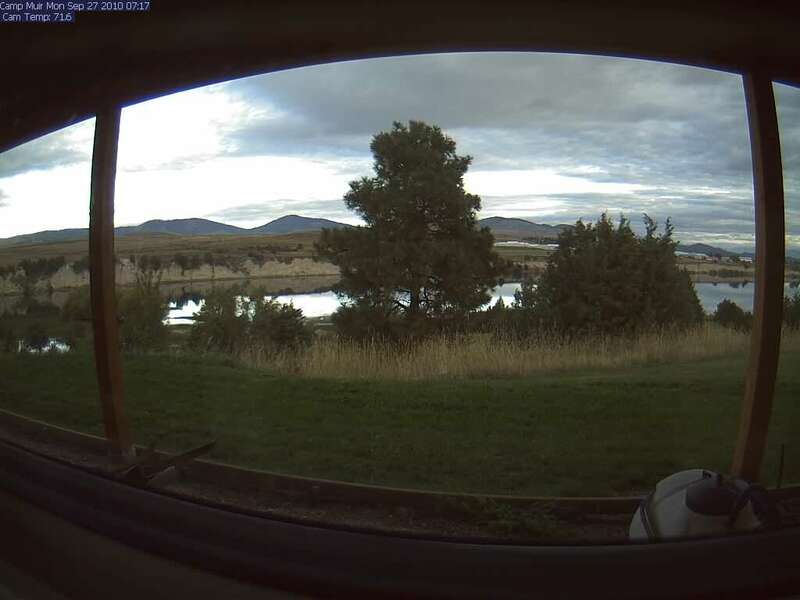 It is an NPS webcam, a StarDot NetCam SC Vandal Resistant Dome with a prominent "US GOVT PROPERTY NATIONAL PARK SERVICE" barcode sticker on the side (barely visible in the image). I'll email Stefan and ask him when the camera image will be online, and what the correct URL will be. Yesterday(tuesday) turned out pretty well up there. I pulled into the lot at 8:30am under grey skies and light snow. I sure was happy to have the sun on my face by McClure rock. Looks like you had some fun as well. 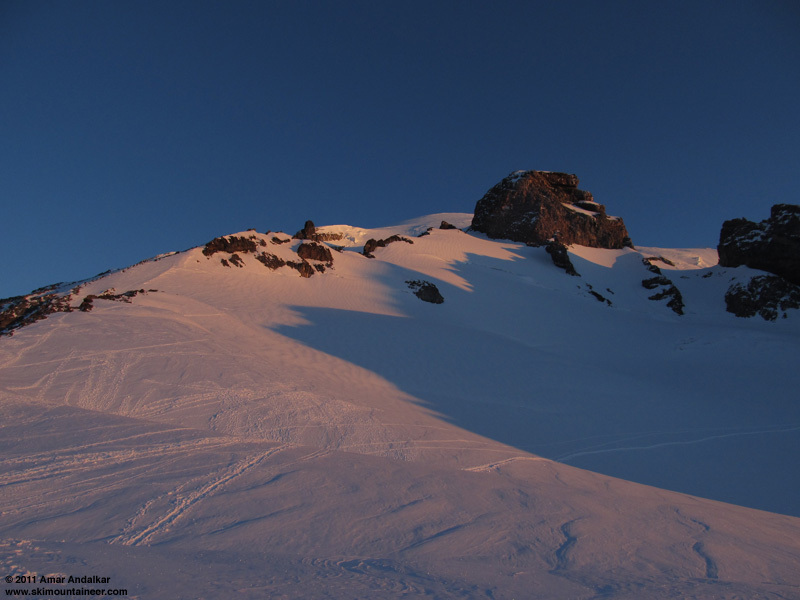 The new Camp Muir webcam is now online as of June 2 (although uploads still appear to be intermittent) at http://www.nps.gov/webcams-mora/muir.jpg. The time stamp on the image is incorrect for now, showing January 2000.